Bottom Line: very nice looking speakers with a unique sealed and ported three way design. Good power and excellent range. Very large and heavy for bookshelf speakers. Might be worth a premium for some, others not. *See the discussion below per the unique design. **When nominal/RMS power isn’t specified by manufacturer, we use an approximation of ~30% of the specified peak/dynamic power for comparison purposes. Polk has historically produced a lot of high end speakers, but is also arguably the pioneer of “residential” audio: hifi quality speakers that were reasonably affordable for individual enthusiasts. These days, that’s the lions share of Polk’s products, and several of them are indeed among our top picks for budget-tier audio equipment. The LSiM lineup is an exception: they’re the most expensive (non-commercial) speakers Polk currently sells, and while they’re not exorbitant, we’d definitely put them out of the budget-tier. The lineup consists of two different tower speakers, a center channel speaker, and the bookshelf speaker, which we’re reviewing herein. Polk definitely puts effort into aesthetics, and even their budget speakers tend to be more stylish than the competition, but the LSiM 703 really goes above and beyond and looks really fantastic. The convex top of the cabinet, which has a purpose which we’ll get too, is a nice deviation from the boilerplate box shape of bookshelf speakers. The cabinet itself is layered – MDF on the inside, and an actual veneered wood on the outside that comes in cherry or black. The black looks nice enough, but why not go with the cherry to really see the actual wood, and that also brings a nice retro look that’s reminiscent of bigger and older speakers circa the 70s. While the inside of most speakers’ cabinets is simply an empty box, the cabinet of the LSiM 703 is meticulously partitioned, all as part of their proprietary design. The tweeter and midwoofer is sealed in its own “sub” cabinet, which favors a very tight and accurate response curve; and the subwoofer has its own dedicated enclosure that’s ported, which favors a maximally loud and full bass response. It’s essentially a sealed and ported speaker all in one, bringing the best of both worlds together. We’ve never actually seen such a design in any other speaker that we’ve reviewed. Per the above the LSiM 703 is indeed a three-way speaker, meaning it has a dedicated subwoofer built in with its own crossover. 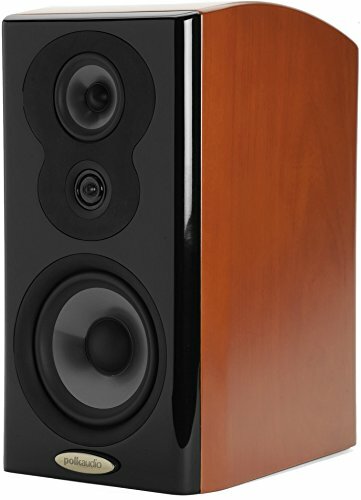 While vast majority of bookshelf speakers are merely two-way and are intended to be paired with an external subwoofer, the LSiM 703 has a response floor of 36 Hz, and while this exceeds the range at which they’ve claimed a standard 3 dB differential, this is still an excellent spec, even if there will be a little drop off. A built in 6.5 inch woofer wont ever truly compete with a full sized subwoofer, but the LSiM 703 could certainly sound excellent with full bass as a standalone pair, and that’s not usually the case with bookshelf speakers. The power specs and efficiency are good for a bookshelf speaker, but not massive. These should get plenty loud for all but very large rooms or full sized home theater setups. For that case, we’d assume the tower speakers in the LSiM series would be the intended main satellites, and those do have massive power specs. We will say these speakers would be overkill for near-field desktop listening. The trade off of the design is that, in needing to cram so much stuff in this speaker, it is in fact the biggest and heaviest bookshelf speaker we’ve ever reviewed – it’s as heavy as some of the smaller tower speakers we’ve reviewed! They’ll need to rest on something sturdy and with plenty of surface area, with additional room for the subwoofer port to breathe. 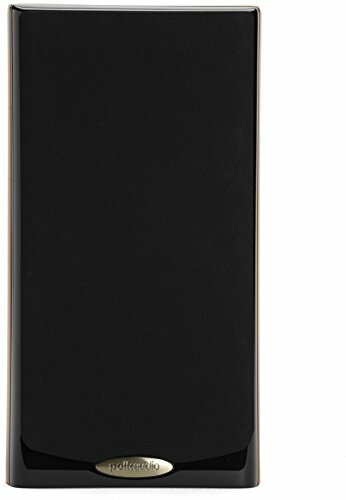 Polk’s passive speakers all come with a 5 year warranty, which is pretty top of the line coverage. Reviewing higher end speakers is always tough. While budget speakers tend to clearly rank themselves with basic specs and build while compared to the price, or one will clearly sound better than the other, when the price tag goes up its not always easy to see or hear what you’re paying for. On paper you could get a pair of bookshelf speakers with as much power as the LSiM 703 for a fraction of the price, and maybe spend the difference on a nice subwoofer or a receiver if you need one. But, when you consider the unique sealed/ported combo design, and how nice these speakers look, they very well may be worth the extra money, which again isn’t at all exorbitant. Or maybe you’re a layperson that wouldn’t even notice the difference, or not care about it enough to pay a premium, or not want to deal with behemoth speakers for that matter. Our ultimate verdict? They’re worth a listening test, and some will decide they’re worth the money. Check out the links below for some alternative recommendations if you’re looking for something more modest and inexpensive.